And we usually do it on Facebook LIVE, too! The BEST way to listen after-the-fact is through Radio Free America. Some of you may know one of my great and regular loves is hosting Trivial Thursdays, a radio show on WRFL-FM in Lexington, Kentucky. Hello, Radio friends! Trivial Thursdays on WRFL is kind of a college radio version of a morning drive-time show—complete with lots of talking, laughing, and music—that revolves (barely) around the trivia associated with the given day of the show. 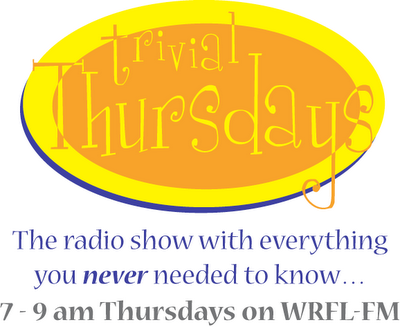 Trivial Thursdays is LIVE every Thursday from 7-9am on WRFL, and you can even listen online to the live show! Trivial Thursdays features a different guest every week. If you're playing along at home, take a look below to see who is coming up on the show. And if you think you might like to be a guest, email me at (please use some basic decoding to help me fight spam) m i ck --at-- mi ck jef fries ==dot== com. Also, if you're into Facebook, there's a Trivial Thursdays group here. Please join and I'll send you a weekly notification of who my guest is!